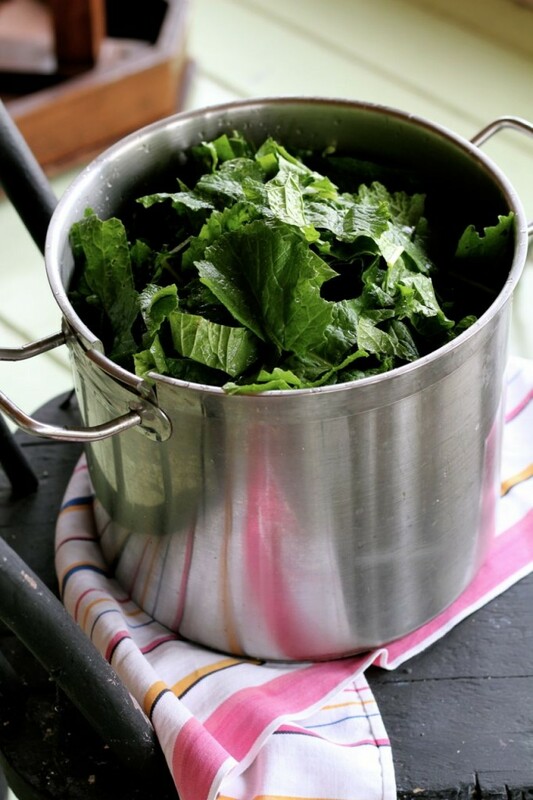 A Fine Kettle of Turnip Greens: How to Freeze ’em, Already! So. I’m not scrabbling out there in my beloved garden from dawn to dusk any longer, pulling weeds and harvesting and fussing about as much as usual. Hauling woodchips. Cutting down weed trees. Bolstering the garden fence. Oh, I’m getting homesick! I know that there’s still stuff out there that I need to take care of, before it gets Cold For Good, and Bryan pulls out the tractor to plow the whole thing under. You know what I’m talking about: those crops that are at their peak of deliciousness now. Things that improve with a bit of frost: greens like kale and turnip greens sweeten with a bit of cold, not to mention celery and parsley! And I have heaps of these particular greens in my garden, Gentle Reader, heaps! Not to mention beets (which also are happy with a bit of cold), a few onions, some mint (thanks, Gene!) and some sage (ditto!) . . . and I think that’s about it for my garden proper (the hoop house is another story, but we’ll get to that later). You wanna know a guilty little secret? I’ve been toying with the idea of just pulling all those goodies, loading them into my wheelbarrow, and tossing them (*gasp* I know, crazytalk!) 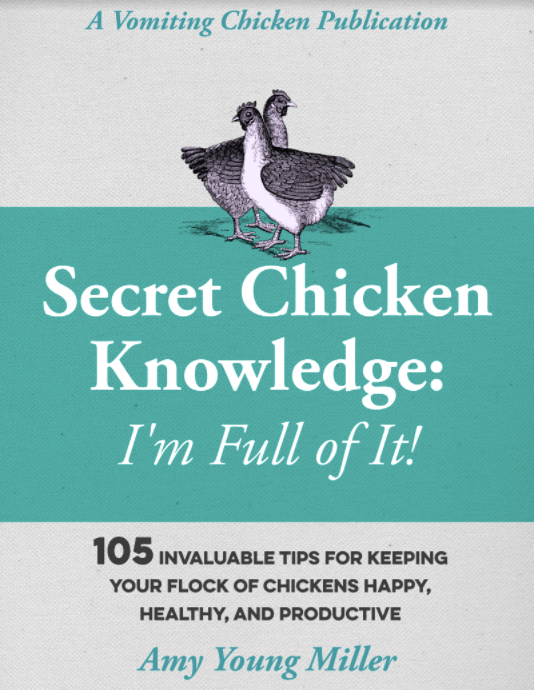 to the chooks. I’ve put up a lot of food over the past few months, and I still have a ways to go. And my freezer, even though it does this magical trick of clearing out a bit of space whenever I need it (Thank You, Magical Freezer!) is Stuffed. Over-Stuffed. Over-over-over-put that heavy can on the top, kids, to keep the lid closed–stuffed. That stuffed. Stuffed!! So I was thinking . . . maybe the chickens should get the rest of this bounty. This thought didn’t come without significant twinges of guilt. . . But then. (Cymbal crash!) I ventured into a very large grocery store in the very large city a few days ago, and my eyes lit on greens in the refrigerated section: they were beautiful. Green. Lush. (Like mine!) And they were $3.00 a bunch. My heart gave a guilty lurch. I thought of my lovely turnip greens, destined to go into my chooks’ bellies. I noticed, in dismay, that these particular turnip greens weren’t even organic. I couldn’t help myself. I did a quick mental calculation (good thing we started school again, and that I have a 3rd-grader to teach, so my math skills are sharp!) and I deduced that I could save roughly $946.35 if I spent just an hour or two and put up about a hundred or two hundred packages of turnip greens into my freezer. Surely I’d be a short-sighted IDIOT not to put those greens into the freezer, right? (Oh please, Magical Freezer, open up just a bit more space, oh please . . . ) And the chooks would still get the stalks and the ugly bits. And I certainly don’t want to be a short-sighted IDIOT. Not. Today. Just think how handy it would be to have all those packages of greens in the freezer, too: greens are one thing that you just can’t eat enough of. Everybody agrees on this, in a world that precious few things are agreed upon. Everybody agrees on this: you just can’t eat too many greens! 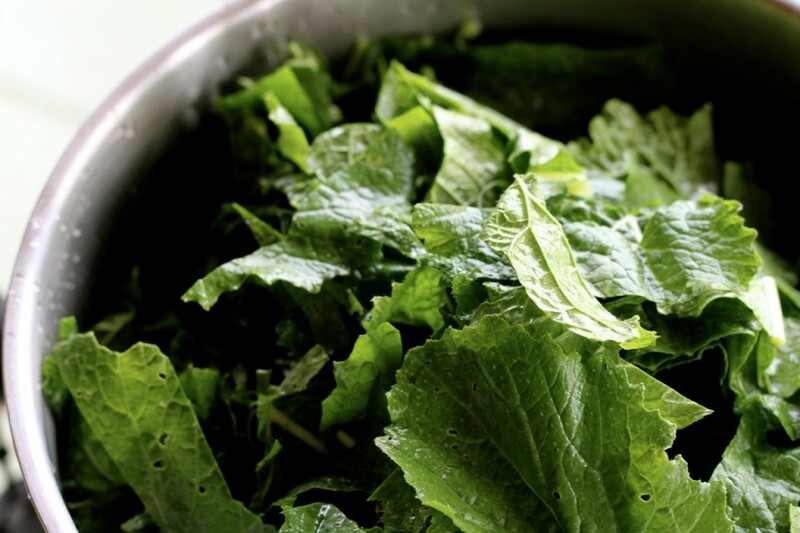 Did you know that turnip greens are among the world’s most nutritious foods? That bitter(ish) taste you might notice in turnip greens is actually attributed, in part, to its high calcium content. Turnips greens are also winners in the glucosinolate department. Let’s talk, just for a moment, about Glucosinolates. Humor me, Gentle Reader. This is awesome stuff. Glucosinolates are phytonutrients that can be converted into isothiocyanates (ITCs), which have fantastical cancer-preventing properties. You’ve heard forever how cruciferous veg like broccoli, kale, cauliflower, cabbage, etc., are loaded with cancer-preventing qualities, right? Well! 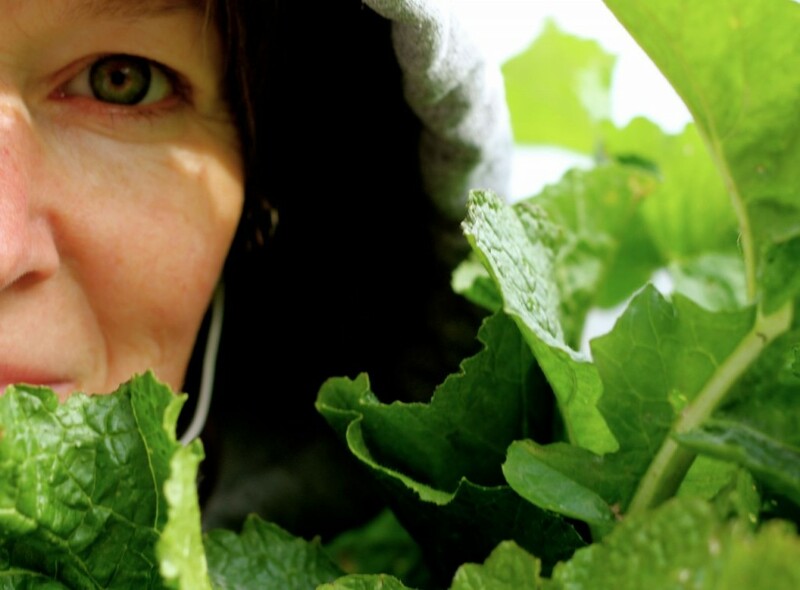 Prepare to be amazed: recent research has shown that turnip greens outscore all of the above in this area. Cool, huh? Turnip greens provide special nutrient support for three body systems that are closely connected with cancer development as well as cancer prevention, to wit: (1) the body’s detox system, (2) its antioxidant system, and (3) its inflammatory/anti-inflammatory system. They are loaded with anti-oxidants. They taste good and can be easily added to stir-fries and soups. Eating plenty of greens can lower cholesterol. Turnip greens are loaded with folate, which is a critical B vitamin to support heart health. Did I mention that they reduce inflammation? They support overall cardiovascular health. You can read lots more about this wonder green here, and then afterwards you can tiptoe out to your garden and harvest your greens and get them into your freezer! It’ll just take you an hour or two. It’s easy to do. And you’ll reap lots of health benefits from them. 1. Pick your greens first thing in the morning, if possible. Note: It’ll be easier to clean them if you wait until after a frost or two, so the bugs are gone(ish). 2. Wash your greens in a clean sink (or dishpan) full of cold water. Drain the water, and then fill it again and let your greens soak for about 30 minutes. Remove your greens carefully (so the dirt and sand grains stay at the bottom of the sink, or dishpan). Drain the water. 3. Chop up your greens and put them into a large pot on the stove. You won’t need to add any water, the bit of water on the leaves will be adequate for steaming. 4. Turn the heat to “medium” and put the lid onto the pot. (Your potful of greens will reduce to about one-third of its volume.) Steam the greens for about 10 minutes, until they all turn bright green and reduce in volume. 5. Remove greens from pot and let cool. 6. Put into freezer bags, press out as much air as possible, and seal. Don’t forget to label them! 7. Lay out flat in your freezer (and let it be a Magical Freezer, too!) and when the bags are frozen solid, you can stack them, reducing the amount of space they use. 8. Use within a year, for best taste: add to soups, stews, stir-fries and what not. Watch your family bloom with health! On a (very much) side note, we’ve got two fun things happening here. . . Ready-Set-SNAP! a photography challenge, with my lovely daughters and their blogs, and a cool giveaway for a beautiful Maple handmade (by my dad) French rolling pin. Check them both out, won’t you? 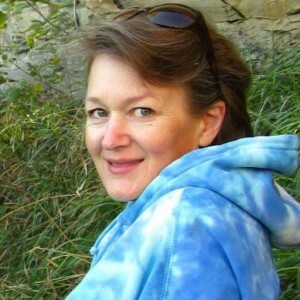 And I’m going to join up this week with the marvelous homesteading types at The Prairie Homestead Barn Hop. Join me! P.S. : “Among all types of cancer, prevention of the following cancer types is most closely associated with intake of turnip greens: bladder cancer, breast cancer, colon cancer, lung cancer, prostate cancer, and ovarian cancer.” –These are some seriously great greens, folks! Does freezing deplete vitamins? I want to cook my turnip greens than freeze but should i cook them all the way than freeze? Blanching greens like turnip greens briefly before freezing is a must. 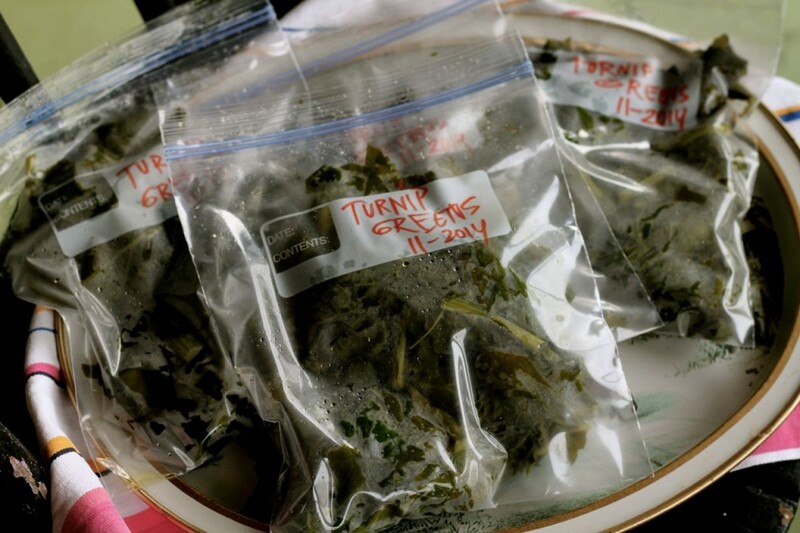 Any kind of processing–freezing, even cooking–takes some of the vitamins away, but I figure that it’s better to have home grown turnip greens in the freezer that I’ve grown myself than any tired old greens from the grocery store. 🙂 You can Google directions to blanching and freezing. I don’t believe the freezing will deplete the B vitamins, Amelia. And the blanching is just for a minute or two, so you ought to be still getting plenty of vitamins!